There are no real love triangles in Scott Porter’s life. The Hart of Dixie actor is known for switching partners when playing charming southern gentleman George Tucker, but in real life, one leading lady is enough. On Saturday, Port married longtime fiancée Kelsey Mayfield, who works as a casting producer. The couple got engaged in January of 2012, following a lengthy four-year courtship. The two initially met when Porter played a football player on Friday Night Lights and Mayfield was a cheerleader at the University of Texas at Austin. According to US Weekly, their first date was simple, and consisted of sushi and a flick. The wedding, however, was a slightly more brilliant affair. 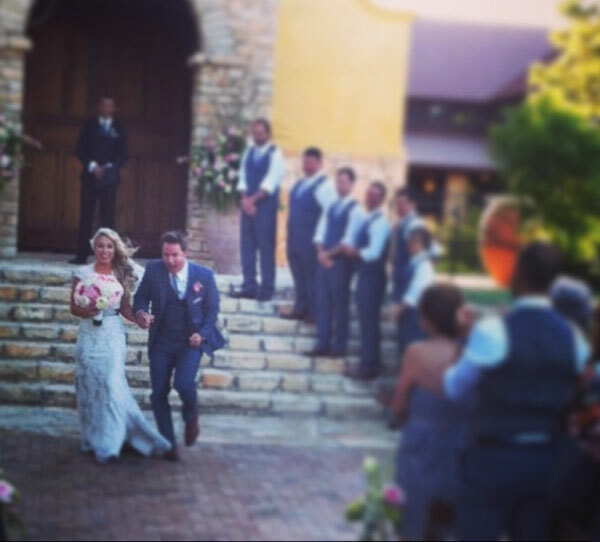 The couple opted to have their ceremony far from the bright lights of Los Angeles, instead opting to head to Austin, Texas, with Porter explaining why they reasoned that way last summer. Plus, it probably helps that Texas was the place the two met. Honestly, the sky sounds beautiful, as does the color scheme, which included Porter in a grey suit and a pink boutonniere. The bride opted for a lace-covered wedding gown and held a gorgeous—and huge—bouquet filled with several pink flowers and cream flowers, as well. With a little luck, everything about the couple’s new life together will be just as beautiful as their ceremony seems to have been.